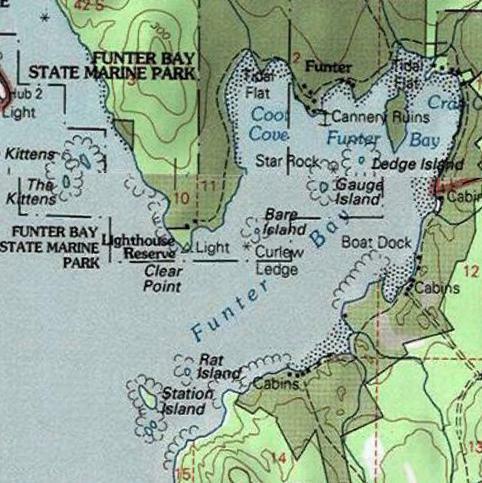 Maps of Funter Bay are a bit of an inside joke to locals. When we wanted to walk anywhere, we usually used the beach at anything but high tide. Mapping companies have long been perpetuating old historic trails and marking them as if they’re still maintained. 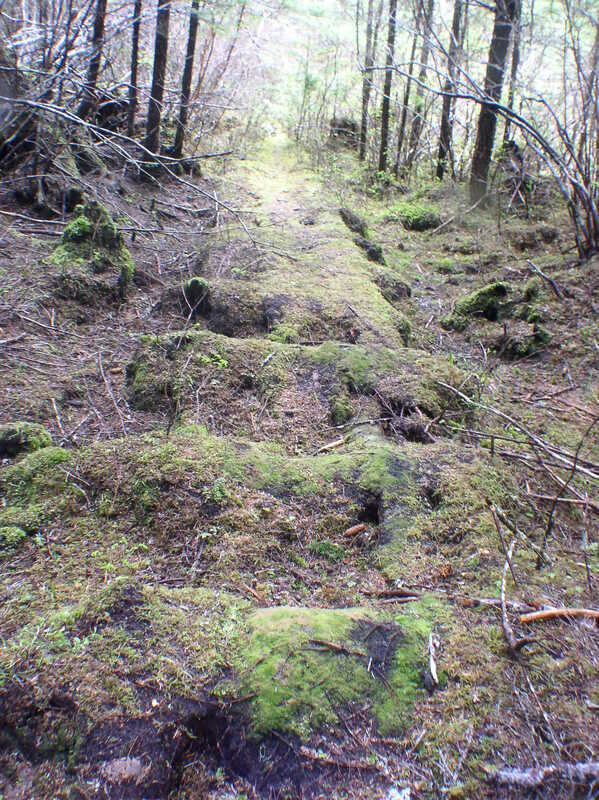 Some online maps even go so far as to show some of these abandoned trails as roads. 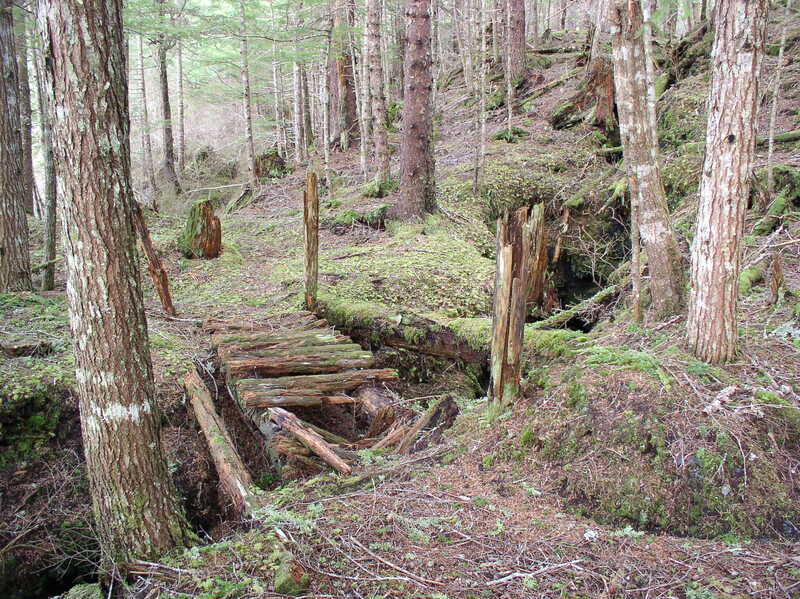 Occasionally some hapless tourist would show up looking for the Bear Creek trail, or a lost hunter would stumble out of the woods thinking he was on the Juneau side of Admiralty Island. 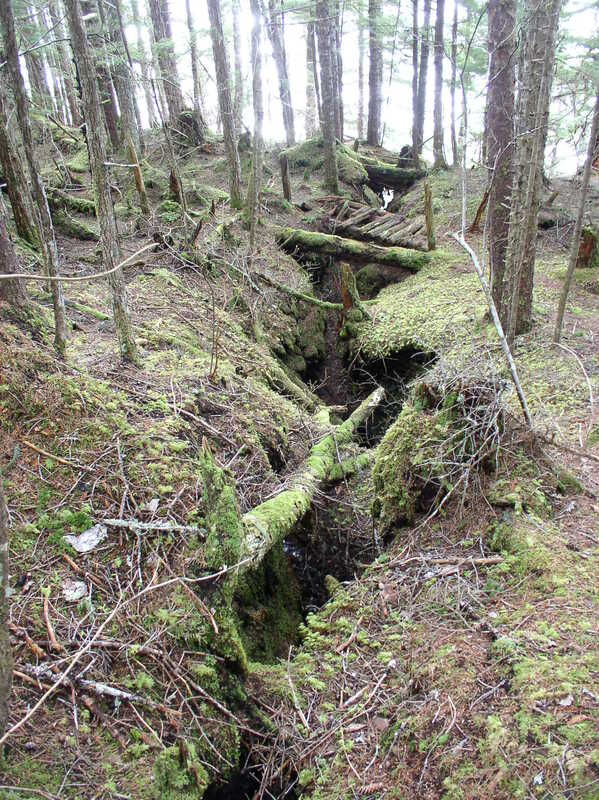 Funter Bay did have an extensive trail system in the early 20th century. A trail reached all the way around the bay, from Clear Point and the Keeler cabin at the North entrance to the sandy beach and the Dana Mine at the South shore. One would think that rowing a boat across the bay would be faster, but winter weather could be nasty, and walking was sometimes preferable. Trails were usually in the woods, near but not on the beach (beach walking is easy at low tide, but high tide eliminates much of the flat ground on the shore). 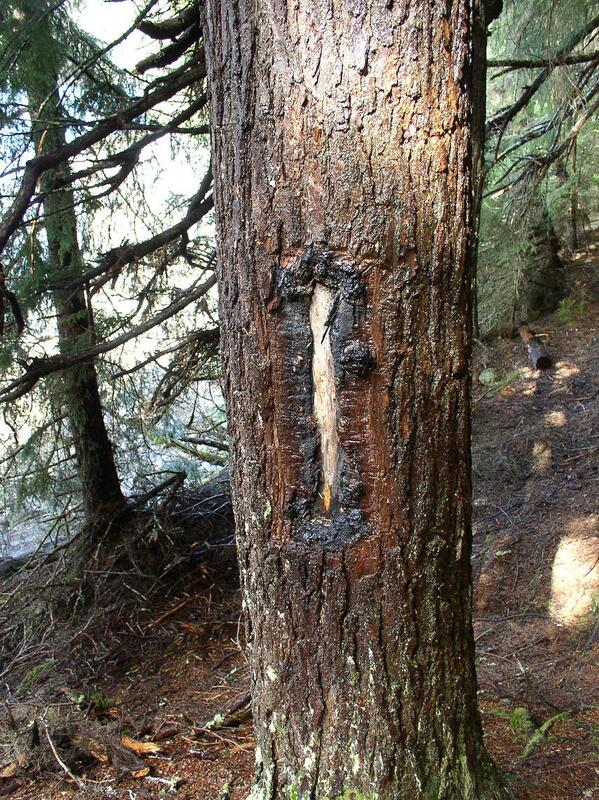 Keeping trails marked and cleared was an ongoing battle against nature. 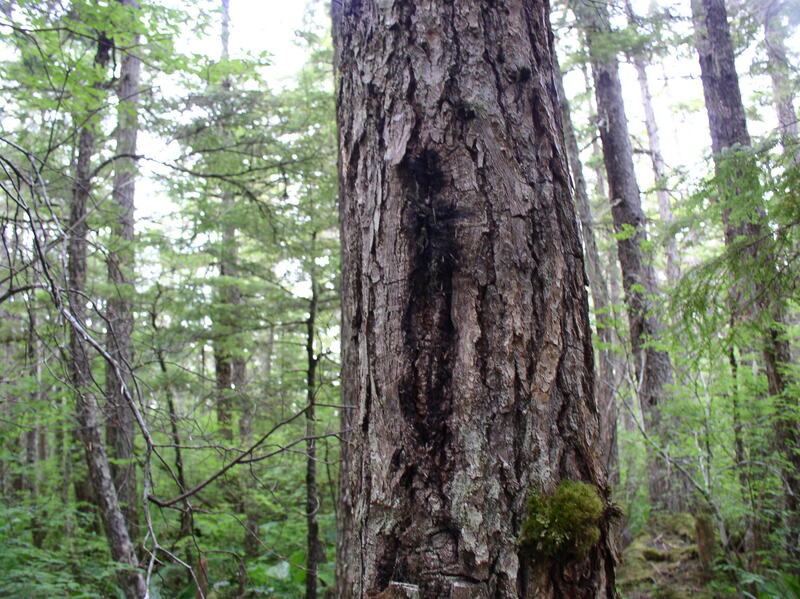 If nature abhors a vacumm, then Southeast Alaska abhors open ground in the woods… opportunistic ground cover, fast-growing bushes, and 2nd-growth trees will rapidly colonize any clearing made by man or nature. Here comes the green and brown! 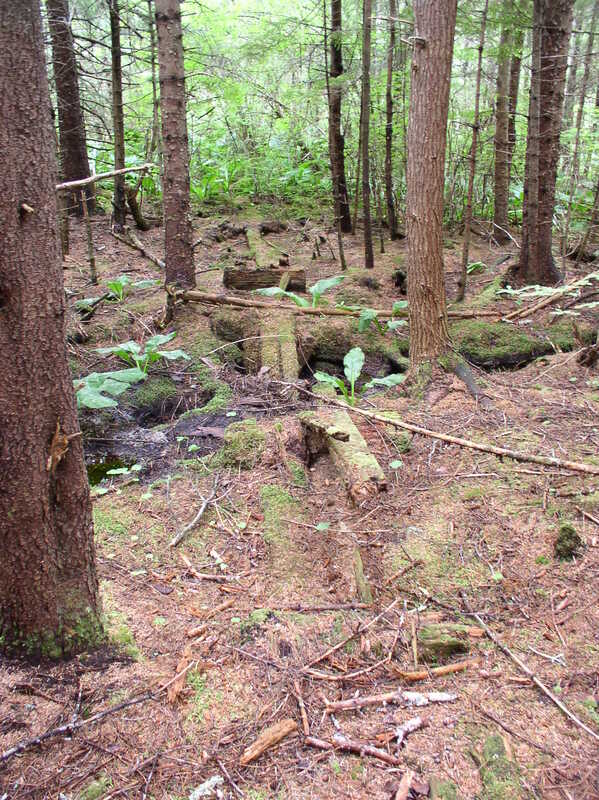 Below is a well-defined historic trail (meaning not overgrown with berry bushes!). 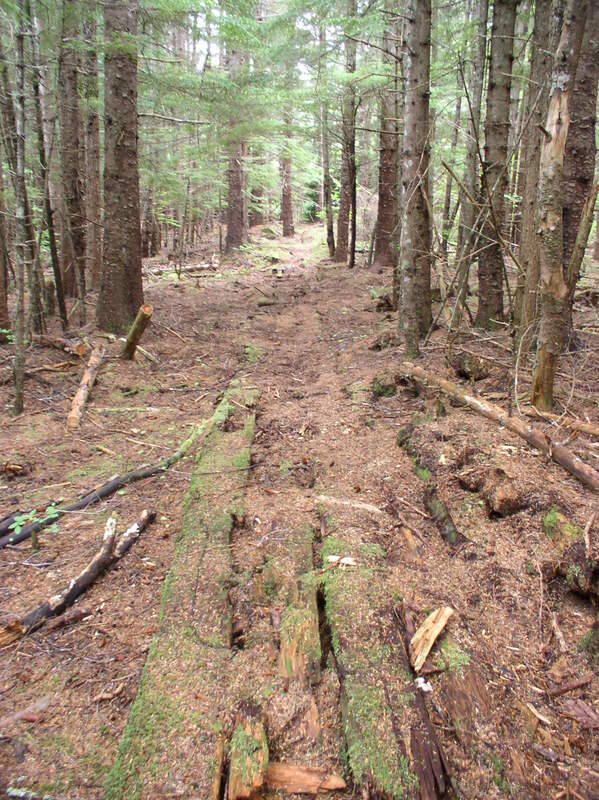 This may not look like much to an outsider, but to a local this is an efficient road through the woods! 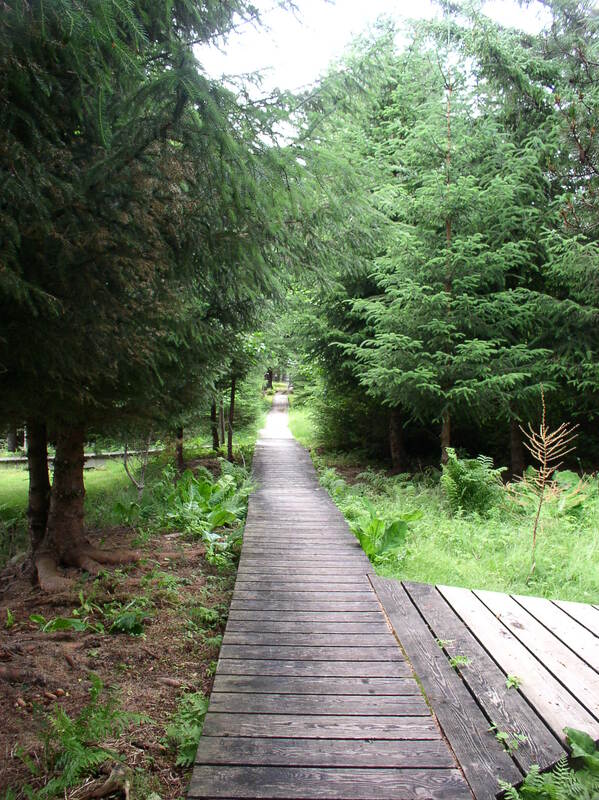 And here is the deluxe version of a trail, a boardwalk! 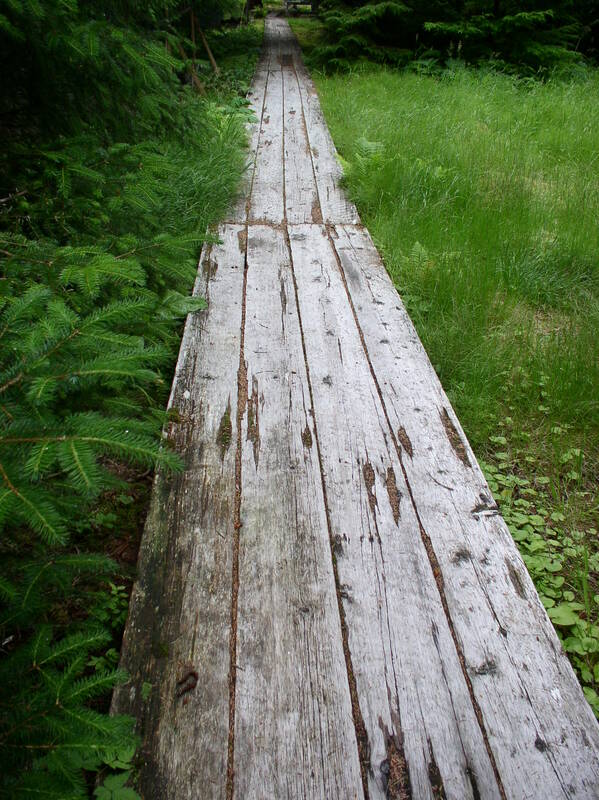 If a trail is the Southeast Alaskan’s road, the boardwalk is their highway! You can do all kinds of city-style stuff with a boardwalk, like ride bikes! My sister and I had bikes when we were growing up, but we could usually only ride them when the tide was out, and only on certain mixes of not-too-squishy, not-too-rocky ground. 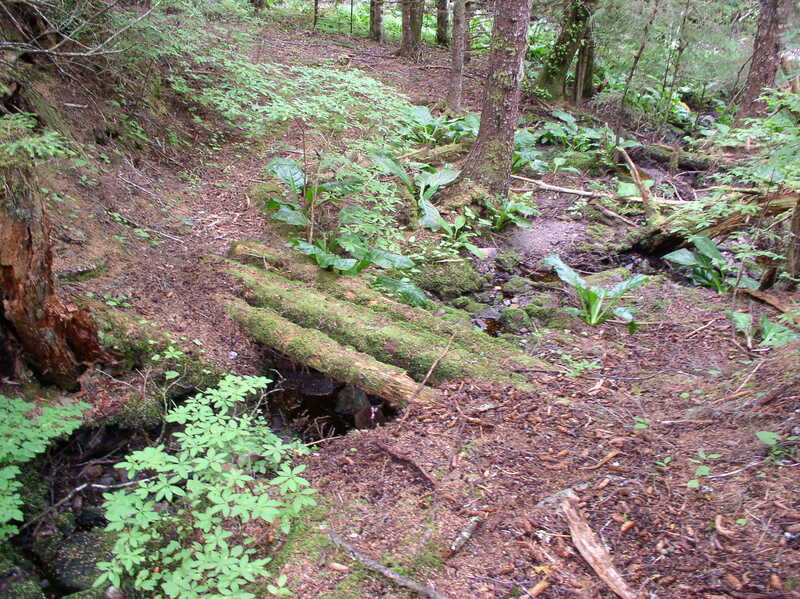 The Bear Creek Trail, also known as National Forest 452, is the “big one”, crossing the pass towards Juneau. This was a shortcut to get to Funter, instead of traveling around Point Retreat, you could take a boat from Juneau to the mouth of Bear Creek, then hike across Admiralty Island in a few hours. Not much remains of this trail any more, there are a few blazes visible, and the remains of a few footbridges, but trying to follow it is an exercise in futility. 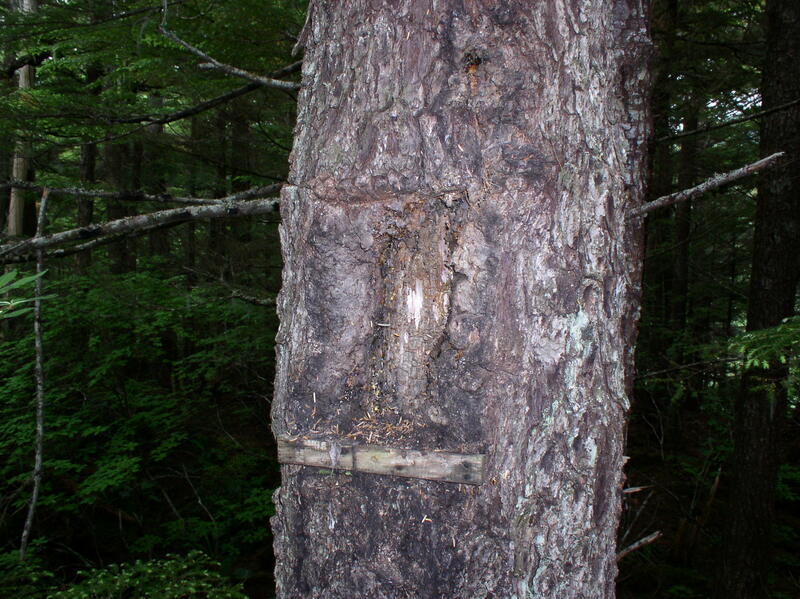 As soon as you are forced to divert from the former path by a downed tree, thick brush, or other obstacle, re-finding the route of the trail is nearly impossible. 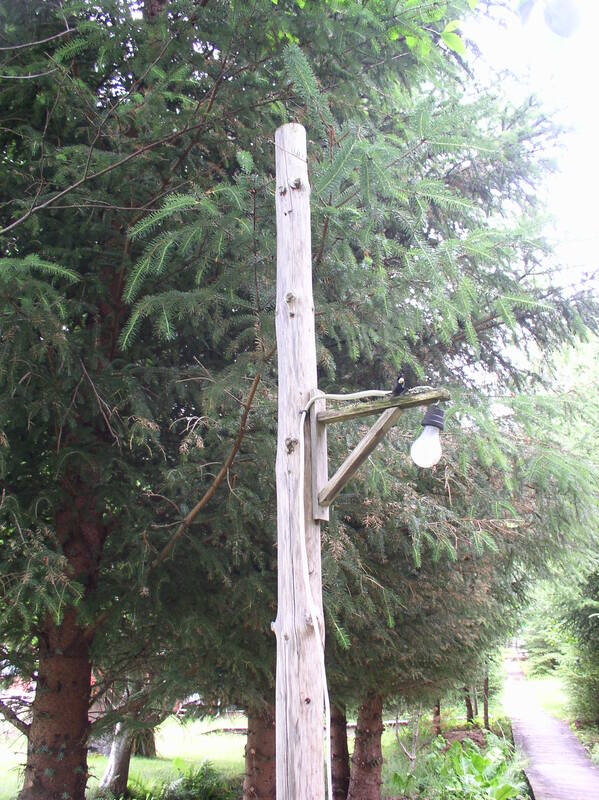 The Bear Creek Trail was made “official” and improved in the 1930s by the Civilian Conservation Corps, a government program to reduce unemployment. 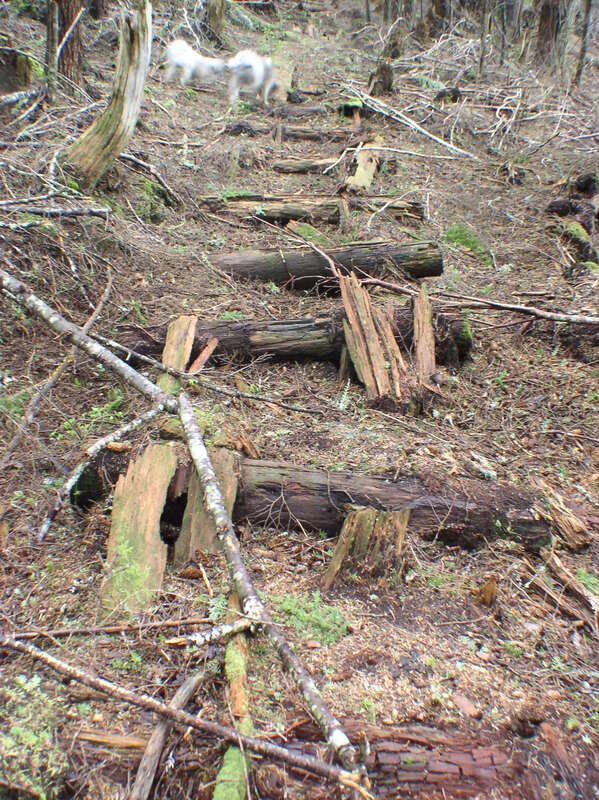 The CCC also built several trails and recreational cabins on southern Admiralty Island starting in 1934 (per Roderick). This document mentions that the Admiralty Island division had 130 men in 1934, and 245 in 1936. CCC work ended when the US entered WWII. From “Juneau:a study of the Gastineau Channel area” by Juan Munoz, 1956. 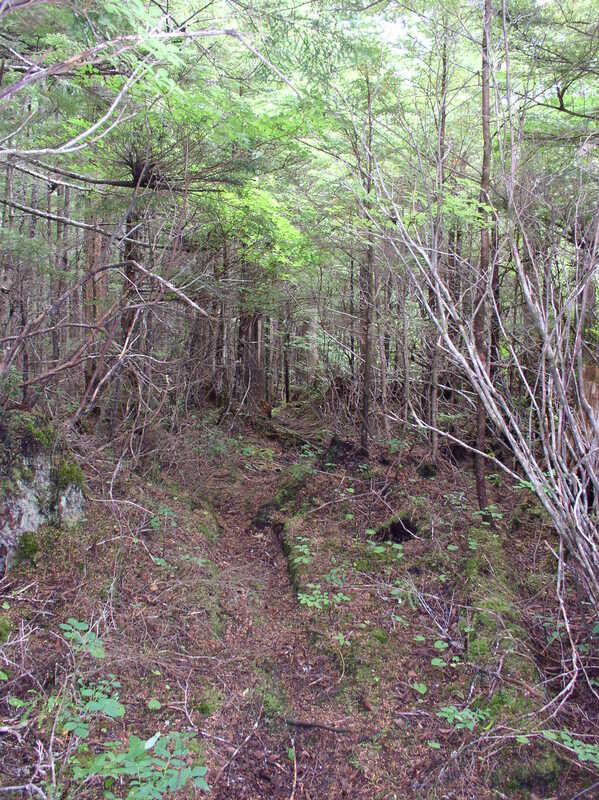 The Bear Creek trail was mentioned in a 1989 land transfer, when the federal government deeded lands on Mansfield Peninsula to the State of Alaska. The BLM retained a right-of way 15 feet wide along the Bear Creek Trail. No one has bothered to do any work on it in the last 50 years or so, and it’s doubtful the BLM could even find or identify where their easement is supposed to be. 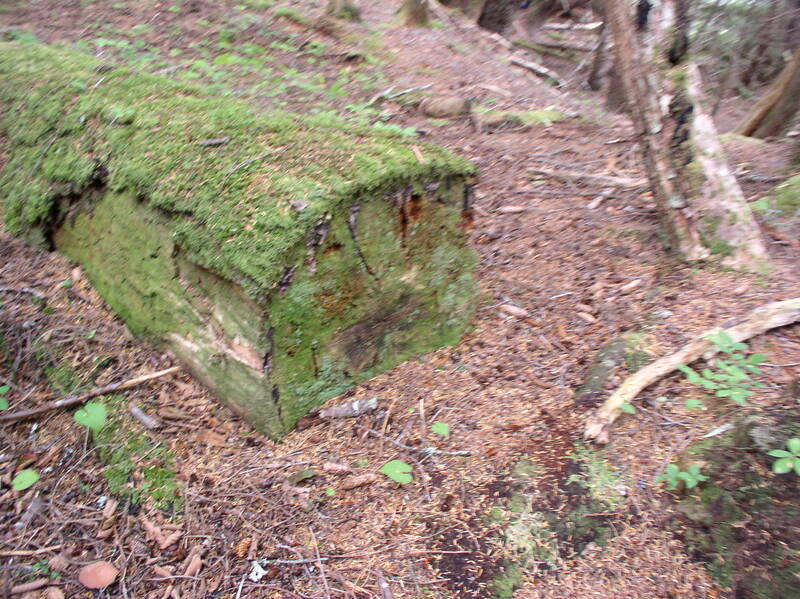 This entry was posted on Tuesday, May 7th, 2013 at 11:41 am and is filed under Funter Bay History. You can follow any responses to this entry through the RSS 2.0 feed. You can leave a response, or trackback from your own site.